1. Make notes about the appointment. If you took notes during the appointment, be sure they're complete and will make sense later. Review your notes, then store them for future reference. Continue learning about your Migraines, medications, and general health. Remember -- The person with the most at stake gets to be in charge. When it comes to our health, that's us. Our doctors, of course, have something at stake in our treatment but, for us, it's literally a matter of our lives. We are in charge. We are ultimately responsible for our health. In interested in knowing what the eight other things to do following an appointment are? Follow the link to continue reading 10 Things to Do After Your Headache or Migraine Appointment. Please follow this link to continue reading - Migraine and Colic - New Research on a Connection. Do you enjoy writing? Are you an aspiring author? Do you long to see your name in print? Do you have something you want to share? AHMA is looking for members who would like to be a part of our blog team. Requirements: An interest in writing; a desire to share with other Migraine and Headache sufferers; Attention to detail; Good written communication and organizational skills; Ability to meet with blog team by phone once a month; Willingness to work with an editor. Details: We are looking for writers who are interested in contributing anywhere from once or twice a month to once or twice a year. 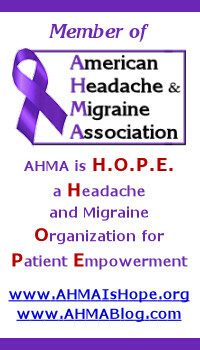 We need people who will write articles about ACHE Tuesday, current events related to or information about Migraines or Headache Disorders; interview and write about leaders in the Migraine and Headache field as assigned by the blog team leader; and personal interest stories related to Migraines and Headache Disorders. All topics will be approved by the blog team leader prior to submission and will be edited as needed. Payment: Lots of thanks and appreciation and the knowledge that you've made a difference in the Migraine and Headache community; however, you're financial compensation will be the same as the blog leader - absolutely nothing! :) Still worth every moment!! Become an active, contributing member of AHMA by being a part of our blog team. If you are interested, please contact blog team leader and secretary pro-tem, Cyndi Jordan, at cyndi@ahma.ws. I look forward to working with you!! This week for ACHE Tuesday, our focus is on the effects of exercise on Headache and Migraine. As those who experience Migraines and other Headache disorders, most of us are well aware of the health benefits of regular exercise. On the other hand, many of us find the thought of regular exercise forbidding considering how we feel. There seems to be a constant tug-of-war between the desire for the health rewards of exercise and the fear of increased pain as a result of exercise. Regular exercise can reduce the frequency and intensity of headaches and migraines. When one exercises, the body releases endorphins, which are the body’s natural painkillers. Some people may get headaches or migraines when they exercise. One possible reason for this is that a part of the physical reaction may be the elevation of blood pressure. This is not a reason to avoid exercise. which is good for general health. Instead, headache and migraine patients need a plan for preventing headaches or migraines when they exercise. Read this week's ACHE Tuesday article, The Effects of Exercise on Headache and Migraine, to learn Dr. Ratherier's helpful suggestions regarding exercise. In last week's ACHE Tuesday, Dr. John S. Wendt discusses the role of mindfulness meditation in those with Migraines and Headache disorders. He points out that since Migraines are associated with a hyper-excitable brain that strategies to reduce stress are helpful in calming some of that excitability. While there are a number of behavioral interventions that are useful, he discusses the role and value of mindfulness meditation. He discusses two major attributes of mindfulness meditation - stopping and observing. He stresses the importance of being still and reflecting in a non-judgemental manner on what one is experiencing. Dr. Wendt indicates that a number of controlled studies have indicated the efficacy of mindfulness meditation in improving depression, anxiety and one's response to pain. He notes that while further studies are needed to study its effect specifically on headaches, "these prior studies suggest that mindfulness likely has a role in in the treatment of patients with headaches." Dr. Wendt also discusses what brain wave and imaging studies show regarding the effect of mindfulness on the brain. To read more about the role of mindfulness meditation in the treatment of Migraine, please see Dr. Wendt's Ache Tuesday article Mindfulness Meditation for Migraine.